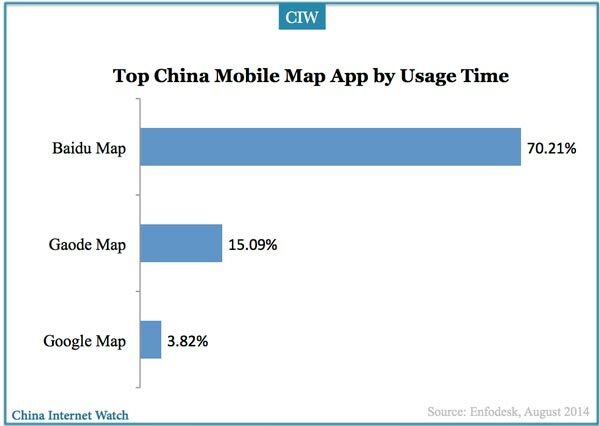 Baidu Map, Gaode Map and Google Map are the top 3 mobile map apps by total number of reached users, according to EnfoDesk. In terms of total number of app launch frequency and usage time, Baidu also dominates. According to another Chinese research company iResearch’s first quarter data, Google Maps beat Gaode Maps in usage time in Q1 2014. Baidu has integrated its mobile payment solution Baidu Wallet in its Maps app and it’s interesting to see how Baidu will utilize the popularity of Baidu Maps to get more mobile shopping market share.